By now, most Realtors know to post their listings to Craigslist. Some of us even include the full social media gamut of Facebook, Twitter, LinkedIn, etc. We post our favorite new listings, our property galleries, our blog posts... but how do we know if those links are ever clicked on? When I post a link to the detail page of my listing, how do I know if anybody actually looks at? Even better, if someone e-mails me and asks to see more photos of my new listing, how do I know if they ever open the link that I send to them with more photos? Goo.gl is a url shortener. It's designed to take a long url (i.e. http://www.hawaiilife.com/property240120-1.html) and shorten it, so it doesn't take up too much space when you post it to social media sites like Twitter, which have a limit to the number of characters you can use. Shortening is cool, but analytics are way cooler. 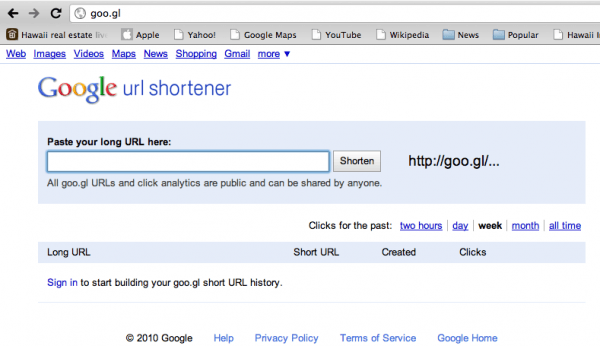 Once you've created your new 'short' url, Goo.gl will track how many times it's been clicked on. For example, today I sent a link for a particular property to an old client of mine. I used Goo.gl, and as soon I saw the number of clicks go from 0 to 1 I knew that he had opened it. I contacted him right away to ask him what he thought.Â Get the idea? When you post to Facebook, or to Craigslist, use a shortened url from Goo.gl and track the number of clicks you get. It's a great way to measure the effectiveness or your marketing. You can shorten any url:Â detail pages, galleries, bio pages, blog posts, anything.